Labels: Crude Oil, Petroleo Brasileiro, Petroleum, Turkish Petroleum Corp.
Petroleo Brasileiro (NYSE: PBR) is scheduled to release its fiscal second quarter financial results after the market close on Friday, August 14, 2009. Analysts currently expect the company to report earnings of profit of 6.97 billion reals, or some $3.81 billion (63 cents per share). 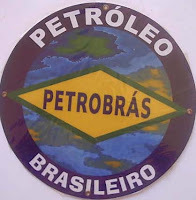 Petroleo Brasileiro S.A, is Brazil's national oil company, engages in the exploration, exploitation, and production of oil and gas, and energy in Brazil and internationally. The company operates in four segments: Exploration and Production, Supply, Gas and Energy, and Distribution. The Brazilian government owns approximately 32% of Petrobras common stock.The company is currently the world’s ninth-largest company by market value. The company's first-quarter net income fell 20% to 5.82 billion Brazilian reals ($2.83 billion) down from 7.24 billion Brazilian reals in the year-ago quarter. Consensus estimates were for the company to report a first-quarter net profit of 5.2 billion Brazilian reals ($2.36 billion). The company also recorded revenues of 42.6 billion Brazilian reals in the first quarter, down 9% from BRL46.8 billion in the first quarter of 2008. In a filing with stock regulators early in August, Petrobras said that it was a net exporter in both volume and dollar terms. Net exports reached an average 267,000 barrels of crude oil and derivatives a day in the second quarter, more than quadruple net exports of 62,000 barrels a day in the year-ago period. In dollar terms, Petrobras reached net exports of $1.45 billion in the second quarter, up from net exports of $208 million in the year-ago period. On May 4, the company set a daily production record of 2.059 million barrels of crude oil, topping the previous record of 2.012 million barrels set on March 4. Petrobras' domestic oil and gas production target for 2009 is an average of 2.5 million barrels of oil equivalent a day. In the first quarter, the company produced a daily average of 2.261 million barrels of oil equivalent. On May 1, Petrobras started pumping out 30,000 barrels of oil a day from Brazil's Tupi field, a very deep offshore field off of the Rio de Janeiro coast. When fully operational, by 2010, the field will net 100,000 barrels per day. Tupi, discovered in November 2007,is estimated to contain 5 billion to 8 billion barrels of crude and is being seen as the largest find in the Americas since Mexico’s Cantarell. Though expensive to tap, the vast size of the country's oil reserves is expected to offset the steep costs of development. The company's offshore oil discoveries remain economically viable with oil at $45 a barrel or higher. Over the past few months, the company has benefited from the installation of three new platforms in the key Campos Basin, which produces more than 85% of Brazil's crude oil. The company recently finalized an agreement to secure a $10 billion loan from China in return for a long-term supply of oil. Currently, the company sells about 60,000 barrels a day to China. Under the deal, Petrobras will supply Sinopec with 150,000 barrels a day for the first year of the deal and then 200,000 barrels of oil a day for the next nine years. Petrobras is also looking forward to oil exploration activities in China. Petroleo Brasileiro is also quite determined to invest in overseas oil and gas projects. Last week, the company signed a deal with Turkish Petroleum Corp. to explore for oil in the Black Sea, Petrobras. The company stands to gain from rising crude oil price. Crude oil has advanced 41% this year, reaching a six-month high above $63 on Wednesday, amid optimism that the global economic recovery is in sight. Most of its investment plan is viable providing international oil prices are at least $37 a barrel this year. The company's Chief Executive Officer Jose Sergio Gabrielli recently said that Petroleo Brasileiro SA will struggle to meet its 2009 domestic oil production target and spend the next three years wringing output from mature wells before new fields come on line. In terms of stock performance, Petrobras shares have gained 65% since the beginning of the year.